It’s Central America’s turn, which now sources the vast majority of known cocaine shipments to the United States. 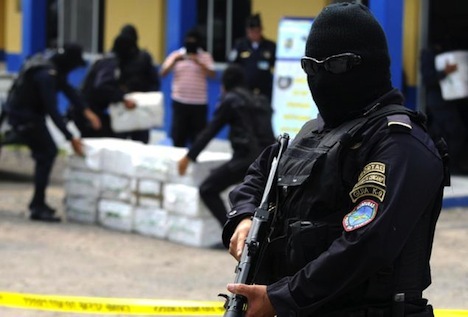 In particular, traffickers found Honduras a particularly attractive target, in part due to the breakdown in the rule of law that resulted from the 2009 coup. Sadly, Honduras now boasts the world’s highest homicide rate, and has a thriving arms trafficking trade to match the drug trade. U.S. assistance to Honduras isn’t just financial – it also includes training, intelligence-sharing and military equipment from the U.S. military and the Drug Enforcement Administration. Last year, the U.S. ambassador to Honduras, Lisa Kubiske, said that because the United States is no longer at war in Iraq, it would be able to deploy even more military funding to Honduras. Joint military cooperation suffered some setbacks last year after the Honduran air force (working with U.S. help) twice shot down flights over the Caribbean Sea, though we still don’t know who was on board or even if the flights were involved in the drug trade. Earlier in May 2012, a helicopter with Guatemalan pilots, Honduran police and DEA advisers, killed four civilians, including two pregnant women, during an attack on drug traffickers along the Patuca River in northeastern Honduras. The effects of US military aid aren’t just more violence, but increasing numbers of drug addicts and the toxic corrosion of trust in public institutions. Even those who support U.S. efforts to assist Honduran police efforts wish the United States would fund additional economic, social, cultural and educational development. That’s not entirely true, given that Honduras is part of the Central America Free Trade Agreement among the United States, the Dominican Republic and four other countries (though Castro de Zelaya and others in Honduras argue that U.S. agribusiness subsidies have made it impossible for small Central American farmers to compete). Roussel is hardly a leftist squish. When you ask him who he considers to be the best Honduran president over the past 75 years of his life, he says Oswaldo López Arrelano, who took power (twice) through military coups and is today remembered mostly for the ‘Bananagate’ bribery scandal that led the U.S. Congress to enact the Foreign Corrupt Practices Act in the 1970s (though Roussel credits López Arrelano with a strong economy and the development of roads, schools and hospitals throughout Honduras). Still, even Roussel believes that U.S. policy in Honduras is largely failing. Rosemary Joyce, a professor of anthropology at the University of California, Berkeley, argued that the United States should stop funding the Honduran police and military until the Honduran government starts taking human rights serious. Until then, U.S. funds would be better spent on other tasks in Honduras. As the United States continues to drive military aid into Honduras, it’s not even clear that U.S. and Honduran policymakers can sort the ‘good guys’ from the ‘bad guys,’ at a time when the Lobo Sosa administration and Hernández, currently the president of Honduras’s national congress, has used the drug war as an excuse to militarize Honduran politics and stifle internal dissent in the name. That leaves the Obama administration open to charges that it’s ignoring human rights violations at time when hundreds of Hondurans, especially LIBRE activists who oppose the government, have been killed or beaten in the past four years. More deeply, it also leaves the U.S. foreign policy community open to attacks that it learned nothing from the U.S. role in the region’s destabilization in the 1980s or, more historically, blowback against longtime U.S. support for banana companies that controlled vital infrastructure and captured concessions and favorable tax treatment from successive Honduran governments in the 20th century, a legacy that even today erodes U.S. soft power in Honduras and Central America. Photo credit to Orlando Sierra / AFP. I KNOW, I NEARLY CRIED. I still think she’ll finish–if the outpouring of sympathy from her fans doesn’t convince her, a shipment of money from her publisher might. Because, after all, even if she gave the f1000irst damn half of the book awyen-yverao-e’s now making grabby hands for the second, and there are still thousands of people who would buy MS (judging by her BD first day sales) and don’t even know it’s been leaked.